Ever faced problems when you have not rode your bike for a week and the battery drained out? 2. Ask your friend to come over to help you jumpstart with his bike battery. Bring jumpstart cable along and that's $20. 4. Have 1 set of our portable battery jumpstarter that acts as your daily portable USB charger for phone and also acts as your emergency bike jumpstarter! 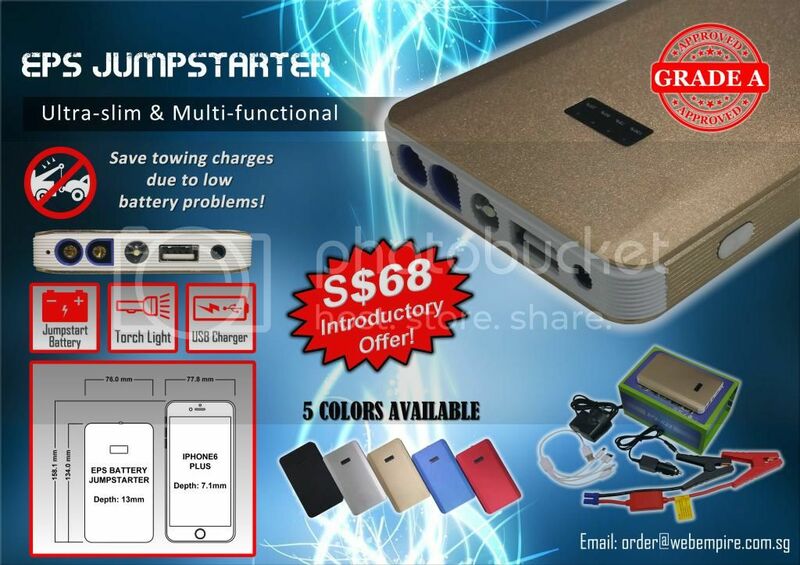 There are many jumpstarters on the market currently and the beauty of our EPS Battery Jumpstarter is that it is the SLIMMEST and uses the best rated lithium polymer battery that provides a starting current of 200A and Peak current of 400A. A fully charged battery allows up to 15 times cranking for a 3L and below gasoline car. The battery jumpstarter is slim and small enough to be kept in the tail segment of the tightest of bikes such as the sports models of most makes. Or simply use it as your daily day-to-day portable charger for your mobile phones, ipad etc. There are 5 colors to choose from: Black, Gold, Red, Blue, Silver. Price is at $68 each and comes with full accessories required for charging USB devices, jumpstarting cable, car charger & 230v charger. To order, please email to order@webempire.com.sg or PM me. Thank you. Last edited by jss; 17-12-2014 at 06:17 PM. EPS Battery Jumpstarter Kit! Smallest size jumpstarter kit suitable for bikers! what is the MAH rating? hi just wanna ask is the charger shock prove? warranty cover? and how long is the warranty? usb port output 1A or ? Hi, The housing is made of alluminium for better heat dissipation. Please define "shock". As per any battery, i believe it is durable to falls and drop but not hammering down on it with mallet. The warranty for the battery is 6 months. Usb port output 5V/2A, 12V/2A. how long does it take for full charge? 1. Can I charge the unit using normal usb cable or does it needs a special cable? 2. Does this has a carrying pouch? 3. Can u show a pic of the complete set. AN650L3 (current): All mod transferred. SW-T400 (till oct 13): voltmeter, safety features disabled. coocase v36+remote. Adjustable, folding Brake levers. Givi AF318 windshield. on-off switch(pilot light, head light, hazard light), electrical seat unlatch,Dr pulley. AN400K6 (apr07-dec11): side deflectors, J Costa variator, Dr pulley slider + HiT clutch. Approximately 3 to 4 hrs sir. 1. Yes u can just any USB cable from iPhone iPad android to connect to it to use as a normal portable battery charger. 2..no it doesn't come with a carrying bag. 3. Please see the first post for the image, bottom right corner of the poster. That's all the accessories included. Interested on getting one set. Can PM me ur location for collection. Hi mira, pm'ed you. Thanks. Bro. I need this jump starter. I have pm - ed u! Pm sent. Up for the day! Hi Sir Can it use to charge IPHONE 6 ? anyone bought it? any user reviews? Hi it is ready stock. Thank you. Hi bro can pm to deal....my batt just gone flat. clocking posts days in SBF is well over. i wan to buy RED color , where to collect? Pls PM where to collect. Pls PM where to deal. Thanks! Hmm though it had been a year fr last posting... u still have stock for this batt pack bro? Hi yan, i have only left blue, red, silver and 1 last piece of gold left. Yes. Left Blue Red Silver.